Nuts and seeds have been part of the human diet since Paleolithic times. A few nuts, such as almonds and walnuts, and seeds, namely flax and chia, get most of the glory, but the fact is each nut and seed brings something beneficial to the table. While exact nutrient compositions vary, nuts and seeds are rich sources of heart-healthy fats, fiber, plant protein, essential vitamins and minerals, and other bioactive compounds, including an array of phytochemicals that appear to have antioxidant and anti-inflammatory properties. A wealth of data from prospective observational studies and clinical trials suggest that tree nut consumption reduces the risk of several chronic diseases, including cardiovascular disease (CVD), type 2 diabetes, and some forms of cancer. Moreover, there may be benefits for cognitive health. Adding support to these findings is research suggesting that incorporating tree nuts in the diet lowers the risk of conditions that contribute to disease, such as hypertension, high cholesterol, insulin resistance, abdominal obesity, endothelial dysfunction, oxidative stress, and inflammation. Various components of nuts, such as heart-healthy monounsaturated and polyunsaturated fats, plant-based protein, fiber, vitamins, minerals, and phytochemicals may work together to offer protection against oxidation, inflammation, cancer, and CVD. • Almonds are high in monounsaturated fats, which may explain their association with lower LDL cholesterol levels and reduced heart disease risk. The antioxidant function of the vitamin E (37% DV in 1 oz) in almonds along with their magnesium and potassium also may play a role in cardiovascular health. One study found that almonds may reduce LDL as much as statins. • Brazil and cashew nuts: Technically a seed, 1 oz of Brazil nuts contains a whopping 767% DV for selenium. That's over the Tolerable Upper Intake Level of 400 mcg. But eating two Brazil nuts per day has been shown to be an effective way to increase blood levels of this antioxidant mineral healthfully. Cashews are lower in fat than most nuts and contain anacardic acid, which may improve insulin sensitivity and help prevent chronic inflammation. • Pecans contain multiple forms of vitamin E and are especially rich in gamma-tocopherol, which has been shown to inhibit oxidation of LDL cholesterol. Oxidized LDL contributes to inflammation in the arteries and is a risk factor for CVD. Pecans also have the highest polyphenol and flavonoid content of the tree nuts. • Pistachios: Two studies have shown that eating in-shell pistachios enhances feelings of fullness and satisfaction while reducing caloric intake. When eating in-shell pistachios, study subjects consumed about 40% fewer calories compared with pistachio kernels. Pistachios have the second highest polyphenol and flavonoid content of the tree nuts. • Walnuts are another excellent source of plant-based omega-3 fatty acids. Walnuts also boast the highest antioxidant content of the tree nuts, followed by pecans and cashew nuts. This makes walnuts one of the best nuts for anti-inflammatory benefits. Like pecans, walnuts are unusually rich in the gamma-tocopherol form of vitamin E. ... Walnut consumption among NHANES subjects is positively associated with cognitive function in both younger and older adults. They're a natural source of melatonin, which is critical in the regulation of sleep, circadian (daily) rhythms, and may play a role in walnuts' anticancer benefits. The following article excerpts are from the talk "Food and Brain" about the best foods for the brain, at the annual 2015 meeting of the American Psychiatric Association (APA). This is in the new emerging field of food psychiatry, or how certain foods and diet influence the brain. The data is emerging that we can positively influence mental health through dietary interventions. For ex. : recent work reported that adults who followed the Mediterranean dietary pattern the closest over 4.4 years had a significantly reduced risk of developing depression (by 40% to 60%). One key comment was: "Perhaps diet is the closest we've come to prevention in psychiatry." Some foods that are especially beneficial for the brain: seafood, greens, nuts, legumes (beans) and occasional dark chocolate. Use smaller amounts of meat (more as flavorings rather than just eating huge chunks of it) on top of a plant based diet. Also mentioned were the benefits of turmeric (because of the curcumin in it) and rosemary. And focus on improving the whole dietary pattern rather than just eating or not eating certain foods. Dr Ramsey, in collaboration with the new International Society for Nutritional Psychiatry, is in the process of developing a standardized "brain food diet." "Food is a very effective and underutilized intervention in mental health," he started off. "We want to help our patients have more resilient brains by using whole foods...by helping get patients off of processed foods, off of white carbohydrates, and off of certain vegetable oils." Though the field is in its infancy, food psychiatry is increasingly being embraced by clinicians and researchers, as a paper published earlier this year in the Lancet Psychiatry attests. "Although the determinants of mental health are complex," the authors wrote, "the emerging and compelling evidence for nutrition as a crucial factor in the high prevalence and incidence of mental disorders suggests that diet is as important to psychiatry as it is to cardiology, endocrinology, and gastroenterology." ..."The data are very promising that we can positively influence mental health through dietary interventions," commented Dr Ramsey. "Hominid diets have changed drastically through millions of years of evolution.,,,But only in the past 100 years has our diet drastically switched from a whole foods diet to one that is more processed and high in refined carbohydrates; that includes more vegetable fats rather than meat fats; and preservatives, emulsifiers, and other additives, which appear to have contributed to a decline in our collective health. Early humans evolved in the African Rift Valley, which is near a seacoast. It's possible that whatever evolutionary spark occurred that made us human occurred here, in part due to reliable access to seafood—oysters in particular—which glutted our brains with omega-3 fatty acids and cholesterol (our brains are composed of 60% fat). Oysters and other mollusks are also very high in nutrients, including B12, which is commonly deficient in people consuming vegan or vegetarian diets and is necessary for myelin and neurotransmitter function. A number of studies have linked the Mediterranean diet (high in fish oils, nuts, and grains and including maybe a little red wine) with advantageous effects on neurologic and mental health. Dr Deans cited recent work reporting that adults who followed the Mediterranean dietary pattern the closest over 4.4 years had a significantly reduced risk of developing depression (40%-60%)....When taken together, most of these dietary pattern studies, which have been conducted all over the world, consistently show that traditional, pre-processed diets are the healthiest, including for the brain. ..."Eat the rainbow," he says, given that bold, bright colors in nature tend to signify valuable vitamins and phytonutrients (the reds, purples, and greens in particular). Seafood: Seafood is packed with brain-healthy omega-3 fatty acids. These healthy fats are also abundant in plants like chia and flax, but plant-based sources aren't as efficiently converted to docosahexaenoic acid (DHA), an important structural component of neuronal membranes. DHA also influences the expression of brain-derived neurotrophic factor (BDNF), which can benefit people who have mood and anxiety disorders. Bivalves like mussels, oysters, and clams are the top source of vitamin B12 as well as zinc: Six oysters (only about 10 calories each) provide 240% of our recommended daily B12 intake and 500% of our recommended zinc intake! Seafood is also a leading dietary source of vitamin D (we don't get it all from the sun) as well as iodine and chromium. Although many people worry about mercury in fish, Dr Ramsey provided an easy way around the concern: Eat small fish like sardines, anchovies, and herring, which typically don't accumulate toxic levels. Leafy greens: A great base for a brain-food diet, leafy greens are a good source of fiber, folate (derived from the wordfoliage), magnesium, and vitamin K. Perhaps surprising, kale, mustard greens, and bok choy provide the most absorbable form of calcium on the planet, more so than milk. Greens also provide flavanols and carotenoids that have beneficial epigenetic influences (eg, including upping hepatic toxin processing). Nuts:... Nuts are packed with healthy monounsaturated fats. They help keep us full and also aid in absorbing fat-soluble nutrients. Nuts also provide fiber as well as minerals like manganese and selenium. A serving of 22 almonds (just 162 calories) contains 33% of our recommended vitamin E, plenty of protein, and minerals, including iron. One study from 2013 found that the Mediterranean diet augmented with nuts is associated with significantly higher BDNF levels in patients with depression. Legumes: Dr Ramsey is pro-meat, but he acknowledges that many people are eating far too much and the wrong types of meat, and that nuts and legumes are a great alternative source of protein and nutrients...Some data suggest that vegan and vegetarian diets are associated with improved mood. But as previously mentioned, these dietary patterns can result in B12 deficiency, which has been associated with brain atrophy and developmental delay. Hence, supplementation is important in this population. Vegetarianism has also been linked with depression, anxiety, and eating disorders, as well as increased healthcare utilization and worse quality of life. These negative associations also could be due to the fact that it's harder to absorb nutrients like zinc, iron, and certain omega-3s from plants. "The notion that the vegan diet is the healthiest diet on the planet is probably incorrect," said Dr Ramsey, before explaining that he just feels that we should approach meat in our diets differently....We want to help patients use beef and seafood more as flavorings on top of a plant-based diet." A modest amount of meat in the diet has its benefits, including nutrient availability: Hemoglobin-derived iron is up to 40% more absorbable than plant-based iron. Unlike most plants, meat provides all of the amino acids necessary for protein synthesis. Dr Ramsey emphasized the importance of seeking out leaner, grass-fed meats if one has the means. The understanding of how microbiota contribute to our mental and medical well-being is rapidly advancing....One of the most powerful interventions to alter our microbiome is diet. Research shows that stressed mice experienced changes in the gastrointestinal microbiota, reflecting the gut-brain relationship. There are 260 million neurons connecting the gut and the brain; furthermore, many commensal gut bacteria make neurotransmitters and communicate with the brain via the vagus nerve....Although the science of probiotic therapies is relatively young, it's clear that these commensal organisms co-evolved with us and are adapted to our diet. Finally, to close out the session, Dr Ramsey returned to the stage and asked, "So, can you eat to build a better brain? We think that you can if you focus on dietary patterns and not a single food here or there." He also reminded the audience to help their patients identify and increase their consumption of nutrient-dense foods and to "eat the rainbow,"..."I don't know of anything else that can potentially decrease the risk of depression in a population by 40%," he concluded. "Perhaps diet is the closest we've come to prevention in psychiatry." ...Evidence suggests that curcumin, an ingredient in turmeric, increases BDNF. Other research has found that populations that eat more curry have a decreased risk for dementia, while rosemary extract may help prevent cognitive impairment. "Many spices seem to have healing properties," Dr Ramsey commented. Although the "Food and the Brain" session at the American Psychiatric Association annual meeting focused on what to eat in the interest of brain health, intermittent fasting might also be beneficial for the brain. In addition to helping maintain a healthy weight, fasting induces ketosis. Ketone metabolism has been shown to be beneficial for the brain and improve cognition in patients with mild cognitive impairment or Alzheimer disease. Keep in mind that fasting can come with risks for some people, particularly diabetics, and should be discussed with a healthcare provider. A Nutty Way to Prevent Cancer? Nut consumption was associated with a decreased risk of some types of cancer but not with type 2 diabetes in a large review.When patients eating the most nuts were compared with those eating the least, those in the first group had a lower risk of colorectal cancer in three studies (RR 0.76, 95% CI 0.61-0.96; I2=51.3%), of endometrial cancer in two studies (RR 0.58, 95% CI 0.43-0.79; I2=0%), and pancreatic cancer in one study (RR 0.68, 95% CI 0.48-0.96; I2 not available). Those results were reported in the meta-analysis of 36 observational studies, with a total population of more than 30,000 patients. Nut consumption was also associated with a lower risk of cancer in general (RR 0.85, 95% CI 0.76-0.95;I2=66.5%), according to the authors. But it was not associated with other types of cancer or with type 2 diabetes (RR 0.98, 95% CI 0.84-1.14; I2=74.2%), found the researchers, who were led by Lang Wu, a PhD candidate at the Mayo Clinic. They published their results on June 16 in Nutrition Reviews. "Overall, nut intake was associated with a decreased risk of cancer," wrote Wu and colleagues. "Given the scarcity of currently available data, however, evidence from additional studies is required to more precisely determine the relationship between nut consumption and risk of individual cancer types." Evidence for the association between nuts and cancer has been mixed, according to the authors. Follow-up time in the studies ranged from 4.6 years to 30 years, found the review. 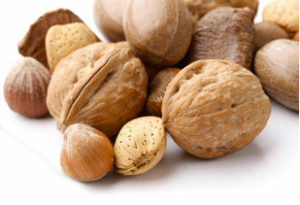 The amount of nuts eaten ranged from none for some of the patients to eating nuts more than seven times a week....No associations were found between nut consumption and acute myeloid leukemia, breast cancer, gastric cancer, glioma, hepatocellular carcinoma, leukemia, lymphoma, ovarian cancer, prostate cancer, or stomach cancer. “For people who already eat plenty of meat and dairy products…nuts and ‘nutty’ legumes, like Brazil nuts, cashews, peanuts and walnuts, are a good nutritional alternative to meat,” Dr. Donal Murphy-Bokern, independent agri-environmental scientist and author of several studies on food system impacts, said in a statement. Heeding this advice means people can reap the benefits that come with eating nuts — Protein! Fiber! Omega-3 fatty acids! Nuts fall into two categories: peanuts (which are really legumes) and tree nuts. The latter includes Brazil nuts, cashews, hazelnuts, macadamias, pecans, pine nuts, pistachios, walnuts and America’s beloved almonds. ...” And existing research generalizes that eating nuts does everything from reduce risk for a slew of diseases, maintains weight, boosts gastrointestinal and bone health, even adds years to a person’s life. As previously mentioned, nuts are pretty much equal in terms of calories. There are, however, some nuts that have more heart-healthy nutrients and fats than others. See: pistachios. This particular tree nut is high in healthy fats called monounsaturated fats (MUFA). MUFAs are often associated with belly fat. One study published in the journal Nutrition found that when middle-aged adults at risk for heart disease and diabetes incorporated more pistachios into their diet, they weighed less and lessened their cholesterol and blood sugar levels after just six months. And a separate study from UCLA found people who regularly ate pistachios lost an average of 10 to 12 pounds. Almonds and cashews are additional nuts high in MUFAs. Folate, as defined by Harvard Medical School, is “the naturally occurring form of the vitamin that is in foods or in the blood.” It’s also the vitamin that staves off brain atrophy, or the progressive loss of brain cells over time... A study published in the American Journal of Psychiatry found folate may ward off depression, too. And which nut is super rich in folate? Unsalted peanuts...peanuts are also high in vitamin E and niacin, both of which boost brain health. Hazelnuts and almonds are known to have concentrated amounts of E, too, so either nut is bound to help your noggin. A new animal study published in the Journal of Alzheimer's Disease indicates that a diet including walnuts may have a beneficial effect in reducing the risk, delaying the onset, slowing the progression of, or preventing Alzheimer's disease. Research led by Abha Chauhan, PhD, head of the Developmental Neuroscience Laboratory at the New York State Institute for Basic Research in Developmental Disabilities (IBR), found significant improvement in learning skills, memory, reducing anxiety, and motor development in mice fed a walnut-enriched diet. The researchers suggest that the high antioxidant content of walnuts (3.7 mmol/ounce) may have been a contributing factor in protecting the mouse brain from the degeneration typically seen in Alzheimer's disease. Oxidative stress and inflammation are prominent features in this disease, which affects more than five million Americans. Walnuts have other nutritional benefits as they contain numerous vitamins and minerals and are the only nut that contains a significant source of alpha-linolenic acid (ALA) (2.5 grams per ounce), an omega-3 fatty acid with heart and brain-health benefits. The researchers also suggest that ALA may have played a role in improving the behavioral symptoms seen in the study.